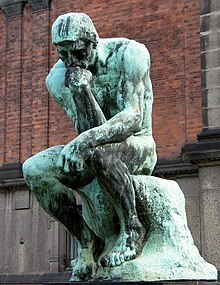 The Thinker (French: Le Penseur) (1902) is a bronze statue. It was made by the sculptor Auguste Rodin. It depicts a man sitting and thinking with his arms bent on his knee and his chin on his hand. Rodin first called the statue The Poet. It was part of a commission by the Museum of Decorative Arts in Paris to create a huge gate based on the epic poem The Divine Comedy of Dante. Each of the statues in the piece represented one of the main characters in the poem. The Thinker was originally meant to depict Dante himself in front of the Gates of Hell considering his great poem. Over twenty casts of the sculpture exist. They are now in museums around the world. Some of those copies are enlarged versions of the original work, while others have somewhat different proportions. This page was last changed on 17 April 2019, at 00:47.